Welcome to the Summer of CHINA! This weekend marked the official opening of the Museum’s long-anticipated series of exhibitions celebrating 3,000 years of Chinese art and culture. If you haven’t seen it yet, make a point to stop in this week and experience these breathtaking objects. The feature exhibition for the summer, The Emperor’s Private Paradise: Treasures from the Forbidden City is garnering much acclaim from the press. Check out with the Milwaukee Journal Sentinel, Third Coast Digest, and the Business Journal had to say about it. The Summer of CHINA includes a long list of programs, events, and lectures to complement the art, and a list of programming can be found here. We hope you will come and experience everything the Summer of CHINA has to offer. Also, don’t foget that Lakefront Festival of Arts is coming up Friday, June 17-Sunday, June 19. 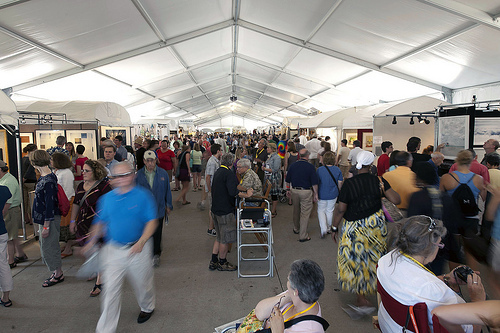 Packed with over 170 juried artists, the PNC Children’s Experience, food from a variety of Milwaukee’s favorite places, music, art, and more, this is the place to be for your weekend. This year, admission to LFOA gets you in to see all of the Summer of CHINA exhibitions, so it’s a double value for your money. What a perfect way to kick off summer – five beautiful exhibitions on Chinese art and a shop-til-you-drop, dance-til-it-hurts, play-with-your-kids, eat-til-you-burst weekend at LFOA. See you at the Museum! This entry was posted in Art, Events, Exhibitions and tagged Events, Exhibitions, Family Programs, LFOA, News, Summer of CHINA. Bookmark the permalink.